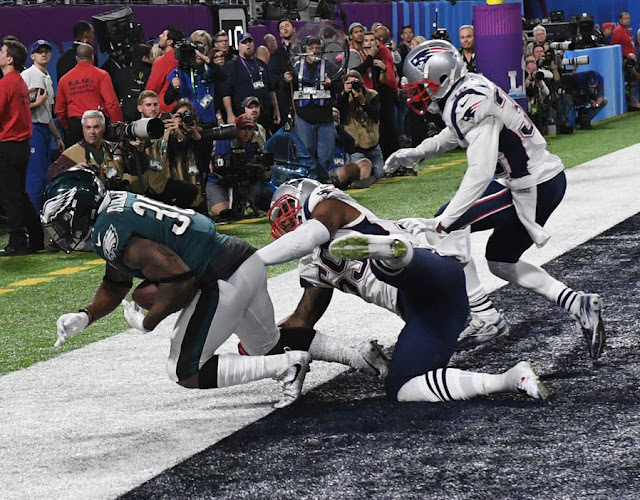 There were some questionable calls in Super Bowl LII that went against the Patriots. One of them, which is probably the most talked about, is the trick play the Eagles ran where tight end Trey Burton hit Nick Foles in the end zone for a touchdown in the first half. The play was technically illegal and therefore shouldn't have counted, but the league sees it as a judgment call. There's really no use complaining about it now, but that isn't stopping some people from doing it. NFL on Fox analyst Mike Pereira is one of those people, and he has a theory as to why some of these calls weren't made. Another big call in question was Corey Clement's touchdown in the second half. Pereira says he thinks that call was correct based on inconclusive evidence. Just my two cents but I think this is why the catch rule should be clarified this offseason. To me, Clement's touchdown should have been reversed. If we're going by the rule, if part of a player is out of bounds without full control of the football, that should be incomplete. I shouldn't have a different opinion on it than others. Either make it clear that a player has to have complete control of the football all the way to the ground without even slightly bobbling the ball while keeping both feet in bounds, or change it and make it a little simpler.